Win7 MAC Address changer is a simple freeware windows program which can change the MAC (Media Access Control) Address of wired and wireless network adapters (Not routers). 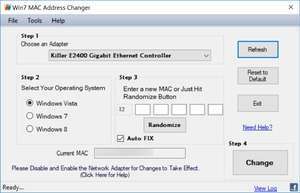 Win7 MAC Address Changer was developed to be a very simple utility and using it is straightforward just select the network adapter (virtual and loopback adapters are not show as it is not need), select your operating system, enter or generate MAC Address and just hit the change button, it is that simple! There are practically many uses of changing the mac address (physical address) such as troubleshooting network problems, software and hardware components, to hide the your identity in a network or just for fun! For security reasons, you should also check out the Win7 MAC Address Changer download at LO4D.com which includes virus and malware tests. Additional screenshots of this application download may be available, too. Win7 MAC Address Changer has a presence on social networks.